Many staff and students around here call her Science Sara. She is the Science Instructional Specialist and an enthusiast for learning how the world works around her. She originally hails from Ohio, but she now considers Colorado home. Before coming to Eagle Rock, Sara spent many years teaching and working with youth in different ways. 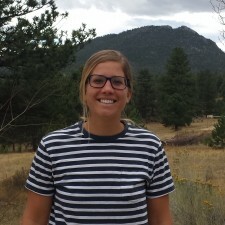 She spent time in the Peace Corps in Morocco as a youth development volunteer, taught English at Horizon Science Academy in Columbus, Ohio, taught science at a nature center in New Hampshire, and led wilderness and leadership trips for youth in the outdoors. She has a background in Biology and Exercise Science from Willamette University in Salem, Oregon. Sara loves supporting young people develop curiosity and confidence in the world of science. She lives on campus with her yellow lab, Champion II, who is often a co-pilot with her in the classroom. I really love when students build confidence in who they are. Students inspire me when they are authentically themselves.